Small progress! I don't want to ever get to the point I was with our last dog...we had to muzzle him, and my 250+# husband had to try and contain him, barely able to, while I cut. Was NOT a fun thing! Why? because ONE time a vet tech cut the quick! He NEVER forgot it!! I got one paw done last week. She was good for the first two nails before freaking out, but I kept hold and got through it. Orzo didn't think too much of that, so he attacked a bubble bottle that was where he could see it. Kind of like the cats that attack the cucumber on you tube. Bribery. It has worked for me!! I put a plate of turkey or chicken on the table. I tell him he can have it AFTER the nails are cut and show the clippers. He sat just as calm, straight and tall as could be to get chicken wing meat or turkey meat! Now, he did get excited and THWAP me in the open eyeball with the lab whip tail, but I sucked up the pain and crawled to give him the plate to re-inforce how good he was!! Not one pull! I wasn't mortally injured as it felt at the time! Cassie won't sit too well for either the Dremel or clippers, but the Dremel is less of a fight. With the clippers she pulls harder and starts screaming (at least for me). I noticed she still pulls for the groomer, but not as hard. She will start to scream, though. My dog, a lab, was always fine with me doing his nails as a puppy. Now, it is like I am trying to stab him to death for no reason! Nothing has changed! I have a feeling it is because the nails are thicker as he got older so need more force to cut them. But I don't think he would sit for a Dremel either. I have to be fast! I use the guard on the clippers to not cut too far and just go as fast as I can to get them all. Bribery helps! I sit a treat (his favorite is organic turkey!) on the table and tell him he has to do the nails first. Does yours sit for the Dremel? It would be so so sooooo much easier if the beasties would only learn to use their "words", wouldn't it! Might be that it depends on the size of dog and type of nail. I know the ACD nails are hard. Even hard to clip with clippers. Maybe that is why most of them are so bothered when you do something with their feet. My last ones that I raised had fits, too, and I started working with their feat when they were tiny. Darlene, I do know people who really like the PediPaws, but it wasn't a great choice for us. We definitely used it for some time before we got the other pet dremel that we didn't like much either. I wonder if it's got to do with having bigger dogs with thicker nails? Good luck finding something that works best for both you and Cassie! Thanks for the information, everyone. I am getting the feeling that I am not pressing hard enough, especially since the sandpaper doesn't even look like it's being used. Kathy, I have the PediPaws, but haven't really tried it. It was only touched on the dogs' feet and maybe ran next to them. Then I heard it wasn't worth getting. It would have been nice if I had heard that before I got it. I can't even sell it for use on small dogs. Maybe it would work on my friend's Shih Tzu (however you spell that -- I can't ever remember) or the new Chihuahua mix that is living there now. My husband does use sandpaper. He said if it's not doing anything up the grit on the sand paper. Darlene - We used clippers for many years, and did run into problems more often than I liked with cutting the odd one too short, so went to the PediPaws first, not such a great product, then tried another that my younger son (who lives in the States) sent to us as a gift - can't remember the name of that one, but it did a much better job then the PediPaws - both were dremels of a kind. We only use the sandpaper DRUM style, and yes it takes a bit of pressure to work properly and quickly. The younger dogs do not mind it at all, but our old fellow only gets one paw done at a time, then has a break with some treats before proceeding to a second paw. That is usually his limit for one session, but sometimes we can sneak in a couple of nails from a third foot if we're really lucky. All of them are the point now that the quicks are receded enough that we really only need to do them once every week or so to keep on top of the nail trimming. Even though everyone is retired now, we still keep them as short as if we were still competing actively. Oh, that would be nice. I have been wondering if I could do a scratching post with sandpaper for my cat. He gets the sharpest claws and is a big fight to trim. Then he goes and uses my furniture for a scratching post. Makes me so mad. Cassie would like to sit on my lap some, but her nails are always digging in so I keep having to make her get down. I use a dremel on my Shorthaires. They have very tough BLACK nails that makes it impossible to see where the quick is, so after one too many bloddy messes, my husband took the clippers away from me. I use the Sandpaper tool on the Dremel.The key is you have to use quite a bit of pressure. My older dog doesn't mind at all and will just lay on the bed and hand me his paw. Which makes it very easy. The younger one doesn't like it at all and I have to bribe him with peanut butter. While my son holds a spoon full of peanut butter I work on one of his paws. We usually only get one done a night and I just rotate paws each night. (he is a show dog so his nails need to be shorter than the average dog). I would rather take a little off each night than too much and cause pain. I probalby spend a total of 15 minutes a day on nails an teeth brushing. I saw plans for making a kind of doggy scratching post that is supposed to let the dogs do thier own nails. I plan on making one in the next week or two and will let you know how it works out. Love the look on that dog's face. Cassie's nails don't wear down or smooth after clipping. My IBS limits our walks out on the sidewalk. She gets her exercise in my large back yard most of the time. I am not comfortable clipping with clippers. Have a special pair that tells where the quick is, but the battery died and right now I can't find the thing that holds the batteries. 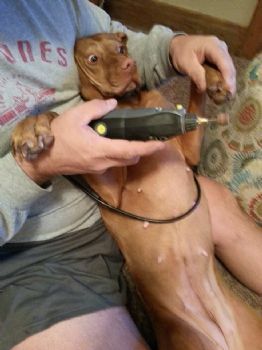 My vet uses the dremel, but I can't afford the $18-20 a month to go there all the time. I already have to take her to a groomer for her anals and they do the clipping for less, but her nails seem to need clipping about every week and that would be over $40/month that I don't have. I have the stuff here to work on them, I just am having problems with them doing much. I use a clipper, or have them trimmed while I am at the Vet. I tried them years ago. Not happening! If you just clip them, they'll grind away any uneven edges really quickly. I'll have to ask my husband what he uses. Regardless....she doesn't like it. I'm curious to see what responses you get. I have the same problem. When you use a Dremel for trimming nails, do you use the sand paper or do you use a metal filing bit? I have been using the sand paper to do Cassie's (and others in the past), but it doesn't seem to do anything. I am just wondering about using one of the metal bits instead. I have taken Cassie for trims, but I really can't afford to keep taking her and her nails grow so fast. She has long quick because of that. So I really need to use the Dremel. She has black nails and I am nervous using the clippers. How many login points today?